I got this book a while ago now, and when I first got it, I loved it! Michael Morpurgo became my favourite author, and I read all his books. Now I have really got bored of him. I re-read born to run recently, and it was not very enjoyable, maybe because I’m older now. This is a heart warming story about a dog and its three friends Patrick, Becky and Joe. After being rescued from the canal as a pup to wandering the streets homeless, Best Friend/ Brighteyes/Paddywack has seen it all. 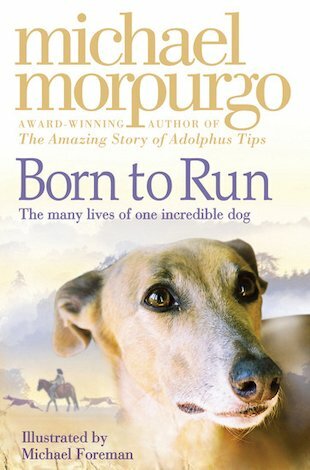 Read this book and join this incredible greyhound in its many lives. the rescue of the dogs is my favourite book this book is so heart breaking. A very heartwarming and sad story!! From the moment Patric saves Best Mate and the other puppies from the canal I realized that this was going to be a sad story, a unforgettable story, a story once read always loved!! This such a wonderful book I would recommend it to anyone!! I could tell this book was sad from the moment Patrick saved Best Mate from the canal. It shows you the whole life journey of Best Mates life right from the beginning. This book has to be read carefuly to understand it properly.Brilliant book! I loved this book. It’s really heartwarming, right from the moment Patrick rescues ‘Best Mate’ and the rest of his litter from the canal. This is such a good book, I would recommend it to anyone! This is a really moving book about one girl and her beloved dog who travel the town in search of a loving home. I would recommend this book to anyone, and I would also give Born To Run a 4 out of 5. I loved this book, it was so entertaining, and heart-warming. It was so good that I’ve read it for a second time, and I loved every single moment of it. A really good read wether you have heard of Michael Morupurgo or not!